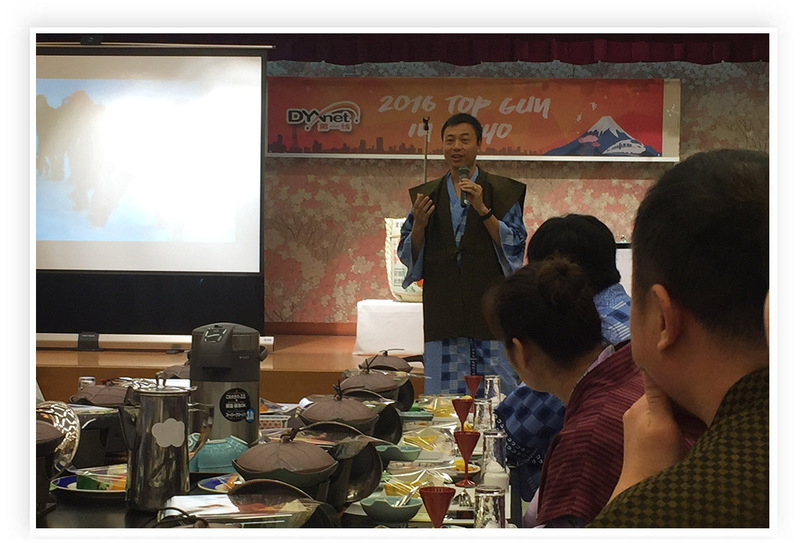 Top Gun 2016 zeroes in on Tokyo! A 50-strong army of sales hotshots and other high performers took Tokyo by storm in early January for DYXnet Group’s six-day “Top Gun Awards” trip. Fun-packed activities were arranged as a gigantic gesture of thanks for the enormous contribution made to our business by the Top Gunners. 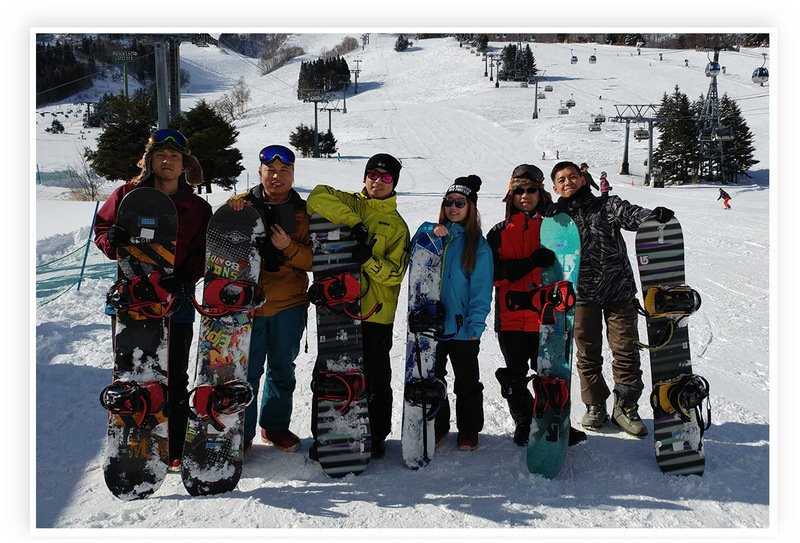 A tour highlight was the Naeba ski resort just two hours from Tokyo, which offers superb snow conditions plus many family-friendly facilities. This proved the ideal place for skiing, snowboarding, sledding and other winter action. 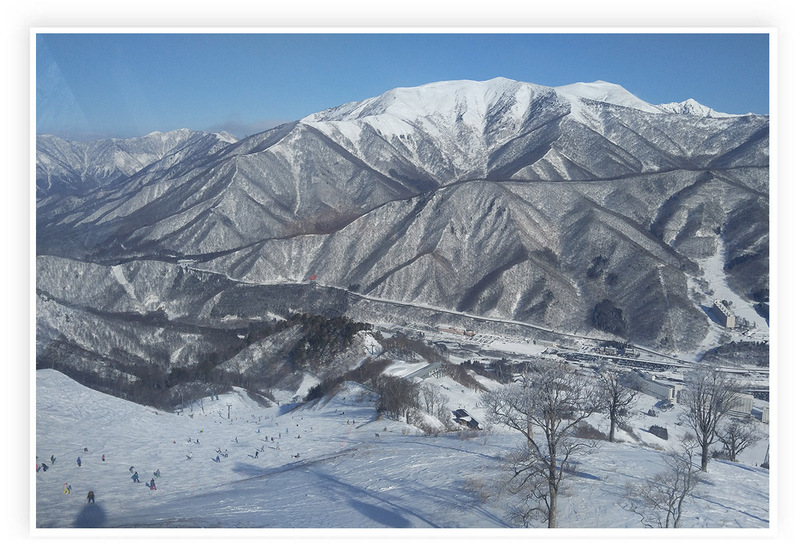 Naeba ski resort’s breathtaking scenery attracts armies of skiers and snowboarders. 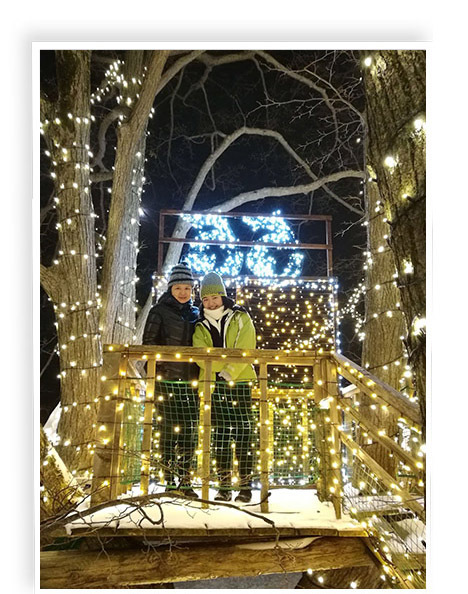 Night-time illuminations add a certain magic to the ski resort, as witnessed by these Top Gunners. Dressed for the part! 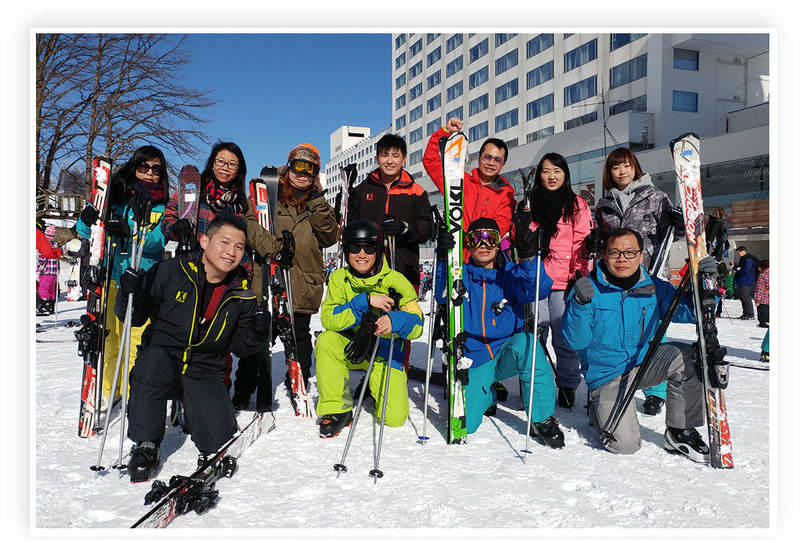 Our high-flyers unleash their ski and snowboard skills after posing for the camera. 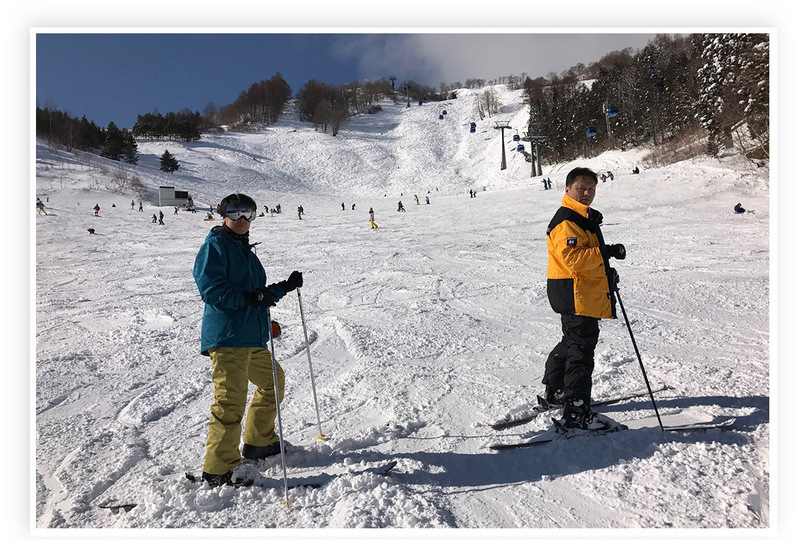 Technology & Research President Max Yeung (right) joins a Top Gunner on the slopes. 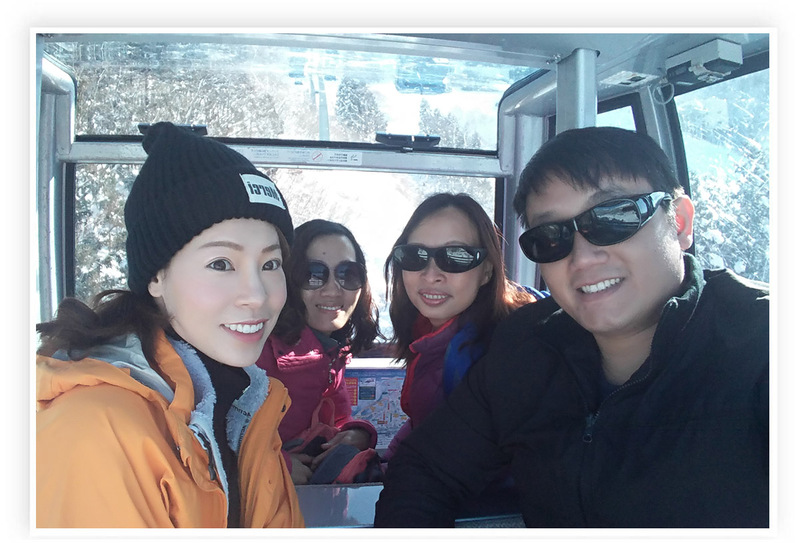 This awesome foursome enjoys a cable car ride to the snow mountain summit. 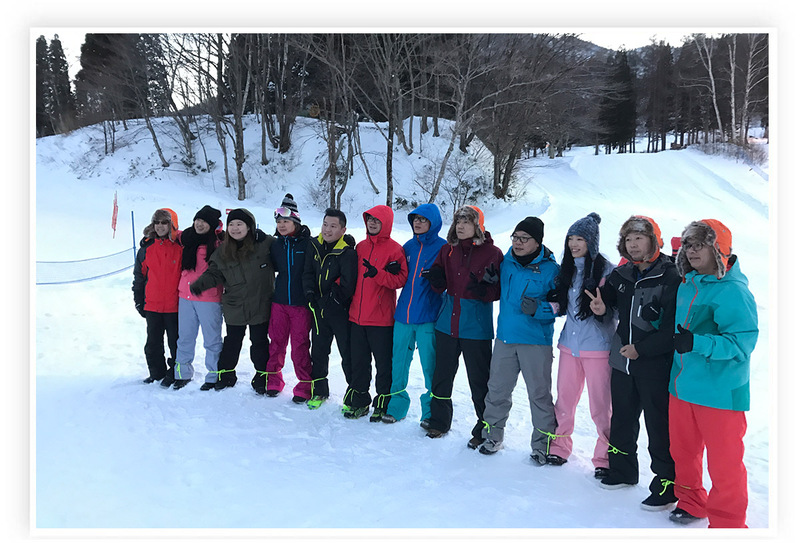 Top Gunners were able to opt for snowboard or skiing lessons, while those with suitable experience were faced with a choice of 44 ski trails offering beginner, intermediate and advanced challenges. 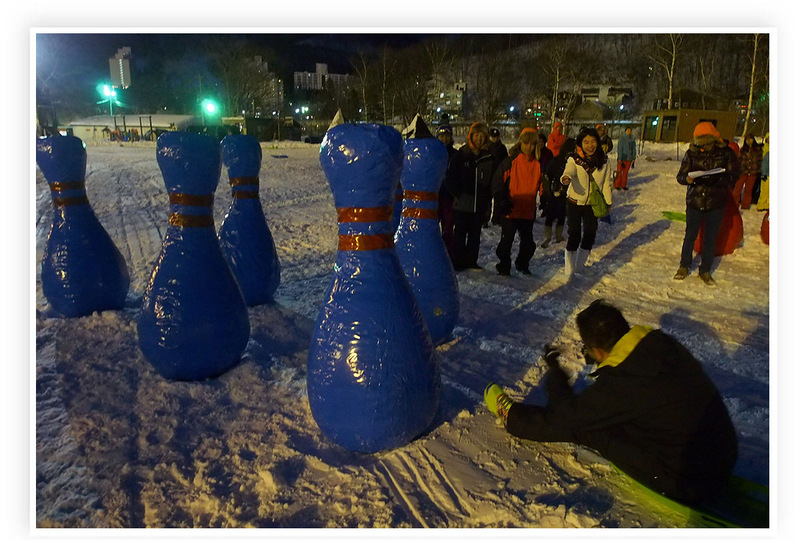 Team-building games played in a spirit of “freezing fun” included a competition to construct the tallest snow man, tug-of-war, a three-legged race and “driving” snowsleds into giant bowling pins. 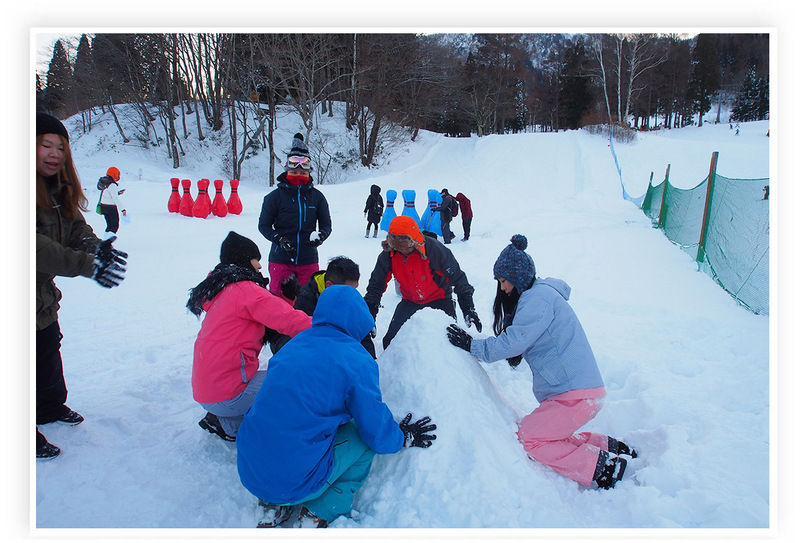 Teams pump immense energy into building the tallest snowman and tug-of-war. 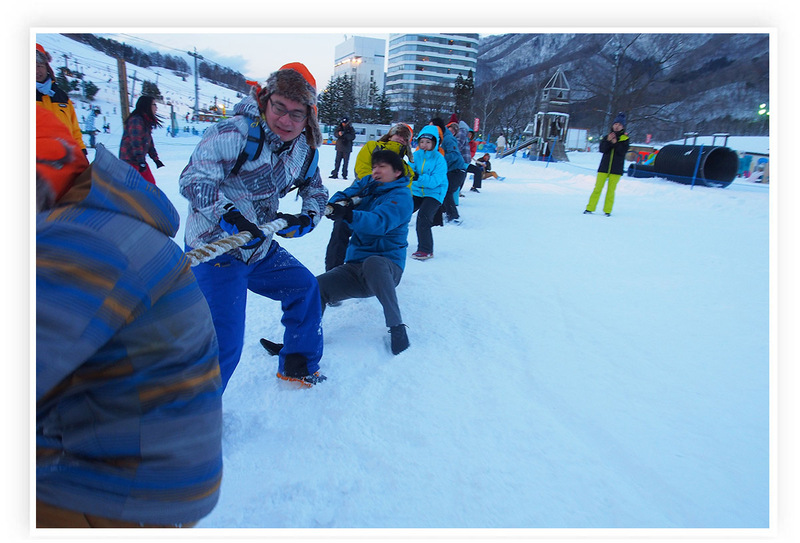 Competing in a three-legged race on snow demands skills difficult to imagine. This Top Gunner’s aim is rather wide of the mark, leaving giant bowling pins standing proud. Better luck next time! 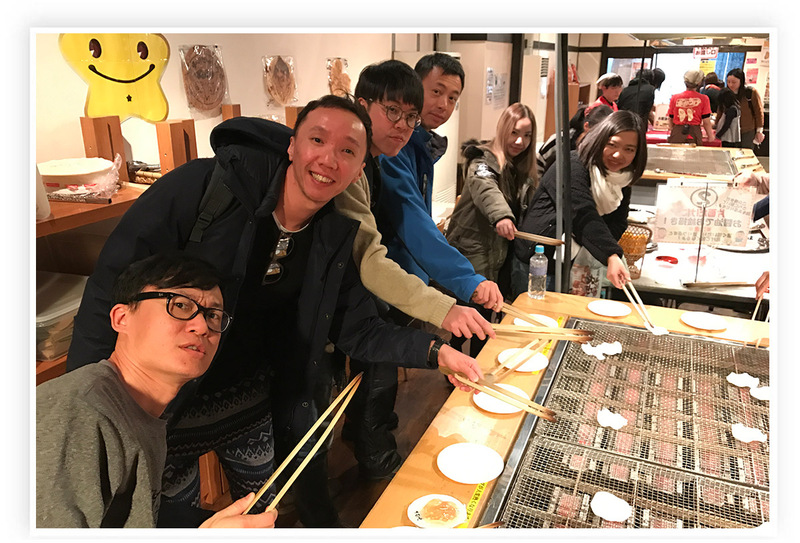 Other attractions included the Ponshukan sake and rice museum, along with the Genbi Shinkansen express railway and Niigata Senbei Okoku rice cracker experience hall plus a hot spring at the Tsukioka Onsen. 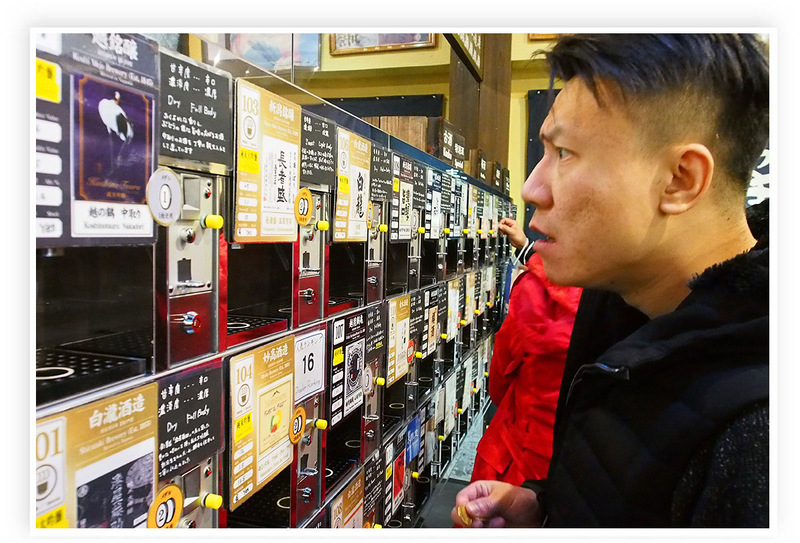 Choosing from more than 96 brands of sake in mini-vending machines at the Ponshukan sake and rice museum can be a time-consuming business. Five cups of sake are yours for 500 yen! 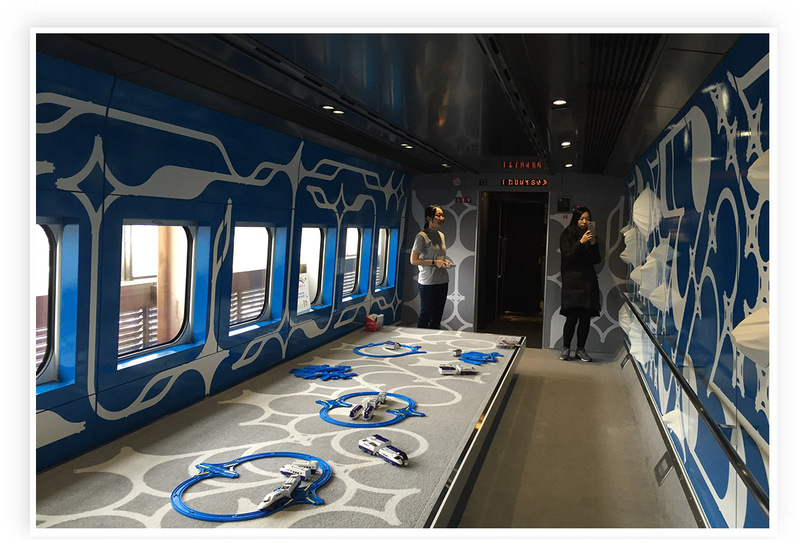 Taking a ride on the Genbi Shinkansen express railway will keep you on your feet – so you can explore all the art on show and visit special play areas. 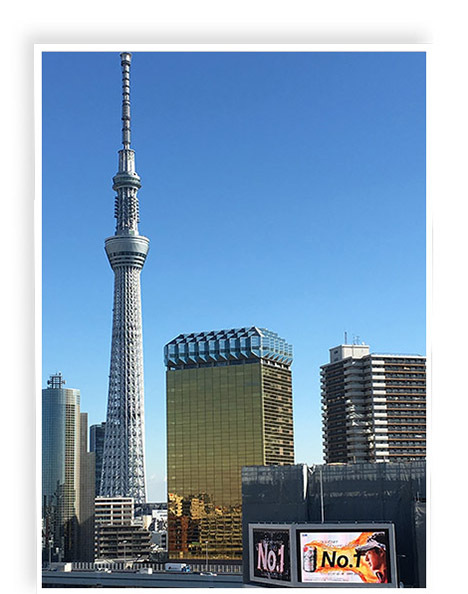 The Tokyo Skytree broadcasting restaurant and observation tower offers unforgettable views of Japan’s capital city. Our high-flyers also enjoyed the Aganogawa river cruise, breweries at Imayotsukasa Shuzo and Minemura, plus the Tokyo Skytree broadcasting, restaurant and observation tower, and Senso Ji’s ancient Buddhist temple. A free day saw some colleagues tripping off to Tokyo Disneyland, while others hit the shops before turning gourmet to put recommended sashimi and sushi eateries to the test. 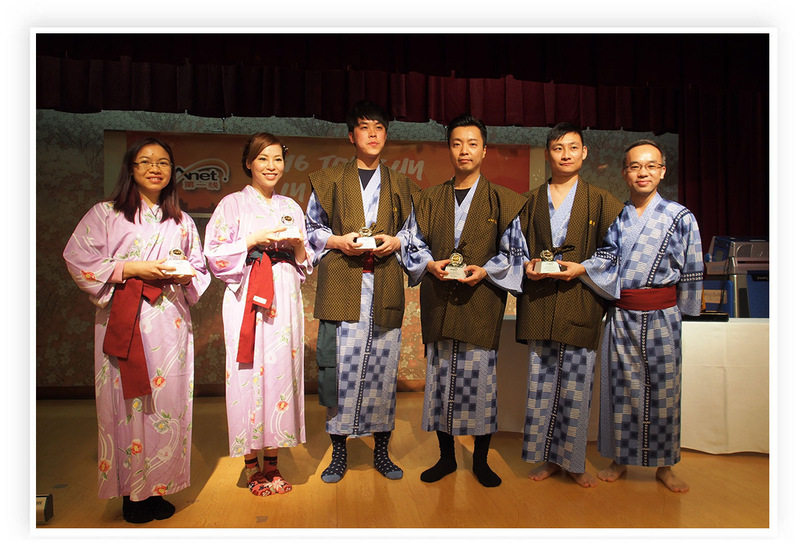 The awards dinner was a sea of colour and tradition because everyone wore kimono-like yukata robes. Founder and CEO Lap Man delivered an inspirational address during which he said breathtaking achievements in 2016 represented a “starting point for tomorrow’s efforts”. He explained how success breeds success and motivates us to take the company up a gear – all in the best interests of customers, employees partners and shareholders. Top Gunners pose with other high-performers. 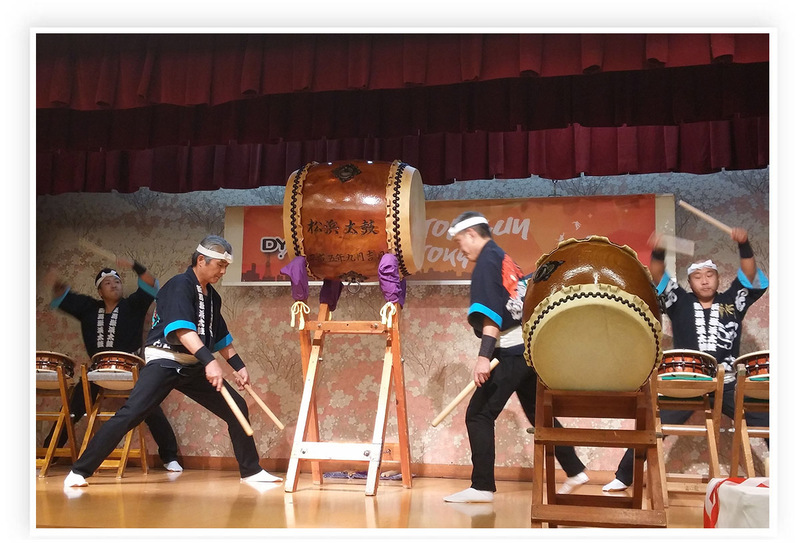 Management team members join forces with sales team heads for the Kagami-biraki ceremony, which entails breaking the lid of a sake barrel with wooden mallets. Let there be drums! These Taiko experts demonstrate an amazing skill during our awards dinner. 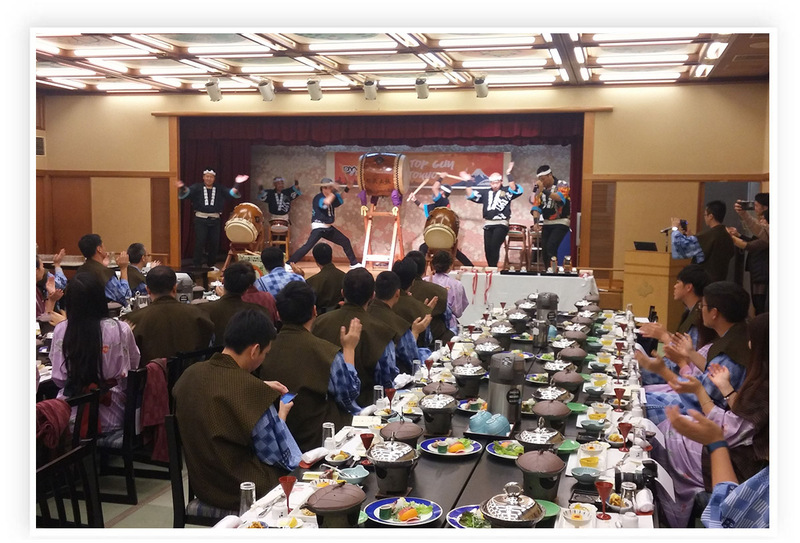 Eyes are glued to the spectacular Taiko drum performance before the Top Gunners dig into some wonderful Japanese food. 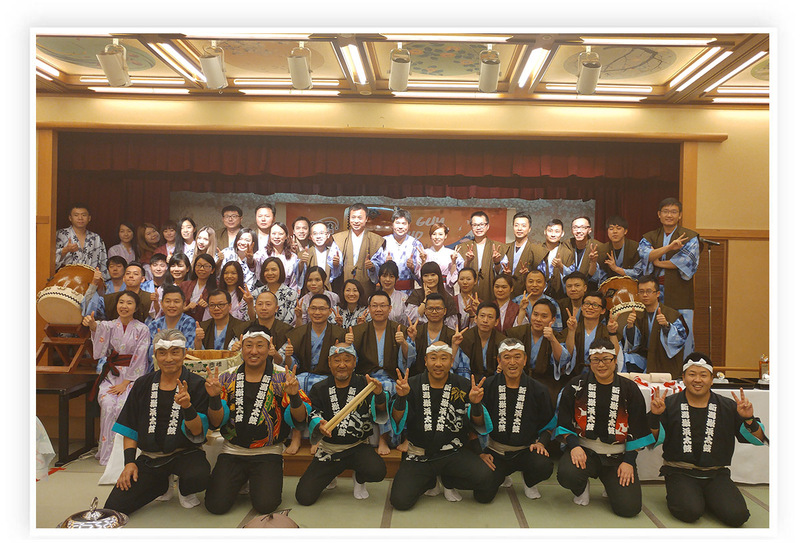 Lap Man’s rousing speech followed a Kagami-biraki ceremony performed by the management team together with sales heads. 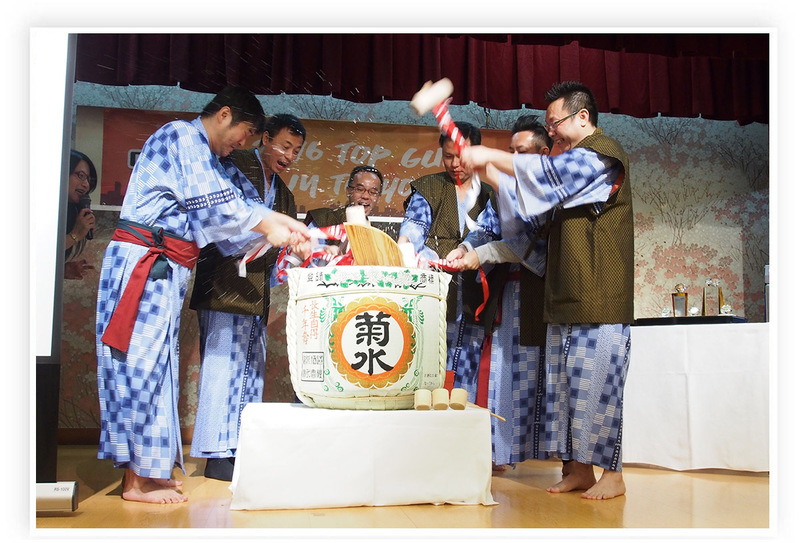 This traditional sake barrel ritual is believed to conjure up harmony and good fortune. Founder and CEO Lap Man delivers a rousing speech. Top Gunners are delighted to receive awards from Network Business President Jacky Wan (far right). This year’s Top Gun event proved to be a perfect bonding opportunity, during which many synergies were discovered between colleagues. DYXnet Group has built a glowing Top Gun tradition over the years, sending parties to exotic destinations such as Thailand, Taiwan and Shanghai.